We've all fantasized about making our exes pay for what they've done to us, but Nora Brank did us all one better and took her ex-boyfriend Nicolas Maier to The People's Court. It was the perfect venue for settling her claim that he stole her stand-up comedy set, word-for-word, after they broke up. Of course, the fact that these two have since reconciled and host a variety show together makes for some strong evidence that perhaps they were, ahem, never exes to begin with. But that just makes this exercise in awkward legal theater all the more genius. 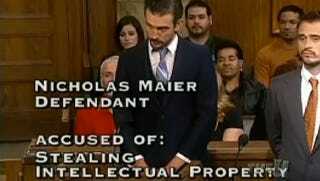 Case dismissed. Everybody wins.